The ultimate Sundance® hot tub. The all new Aspen™ spa lives up to the 880™-Series' reputation as the most luxurious portable hot tubs in the world. Equipped to deliver the healthy benefits of hydrotherapy in an entertaining package. 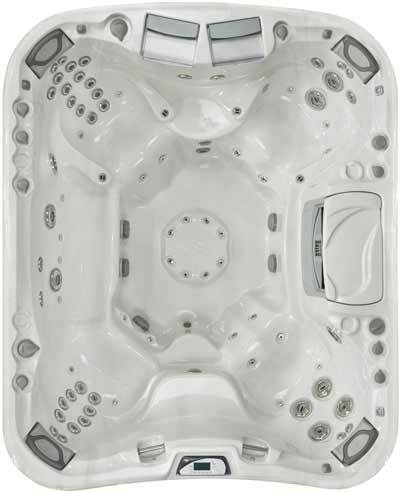 The best of everything in a hot tub is here: a foot dome with eight massaging jets; patented Fluidix™ jets for the neck: 66 jets in total. At night, the SunGlow™ LED lighting system illuminates this gracefully styled, spacious spa. The new slim designed foot mount combined with a wider footwell is designed for easy movement into and out of the ergonomically designed seats. As both an outdoor entertainment center and a therapeutic spa retreat, the Sundance Aspen stands alone as the luxury leader. Learn more about the Sundance Aspen. Dimensions - 7'6" x 9'2" x 41.5"